The Martha’s Vineyard Striped Bass and Bluefish Derby is four days old. For most Island fishermen, their focus is on saltwater fishing. I doubt that many fishermen driving to one of the fabled up-Island bass spots will barely give Mill Pond in West Tisbury a thought. But there is a connection between that beloved scenic mud puddle and the striped bass that are synonymous with Martha’s Vineyard. 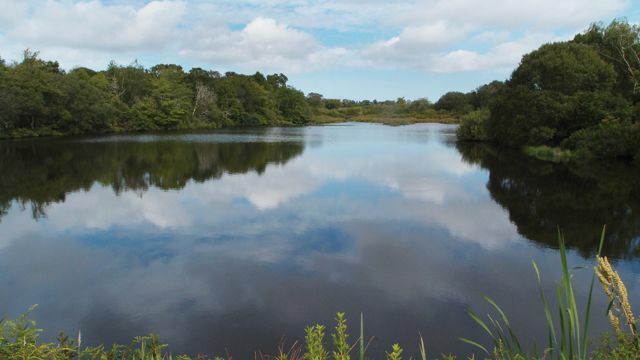 The Mill Pond is a critical link in a stream system that begins in Chilmark, meanders down through several man-made impoundments, and ends in a cove of Tisbury Great Pond in West Tisbury. At one time, the free-flowing stream helped sustain a natural population of eels, herring, perch, trout and other species. The stream was dammed to power a mill, now long gone. But the Mill Pond remained and became a cherished scenic vista. In recent years, town residents have debated how best to manage the pond — to dredge or not to dredge, that has been the question. Then that pesky Prudy Burt, a townie, went and complicated matters. She asked residents and town officials to consider another option: get rid of the dam and begin the process of letting the stream revert to its natural state. 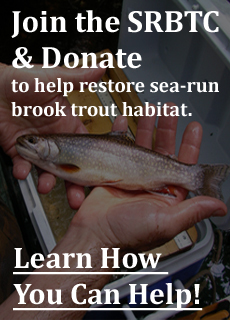 In January, when any fisherman with money and brains was south, she invited Michael Hopper, president of the Sea Run Brook Trout Coalition, to describe how his group had helped restore sea run trout to two coastal streams in southeastern Massachusetts. 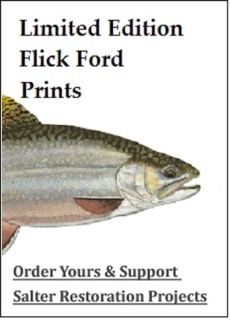 Mr. Hopper, a very sensible guy and fish dealer, described how those accomplishments might serve as models for West Tisbury (Feb. 1, 2012, “Another possibility surfaces for West Tisbury’s Mill Pond”). The intimate get-together in the West Tisbury library was notable in that it was the first time that Mr. Hopper, president of Trans Oceanic Seafoods, had an opportunity to meet Nelson Bryant of West Tisbury, the outdoor columnist for the New York Times for almost 40 years and the author of “The Lady and the Trout,” the story that had inspired Mr. Hopper’s love affair with trout. Mr. Hopper said that although Mill Pond lacks upstream fish passage, it is a problem that could be addressed without removing all the barriers. Mr. Hopper said that, were Mill Brook restored, the existing trout would return to the great pond to feed and find plenty of food there. The frequency of openings to the ocean would not affect the trout. After his presentation, Mr. Hopper knelt in front of the man whose story had set him on his course and asked him to sign a book, “Fishing Moments of Truth,” an anthology he bought at the age of 17. “From 1972 on, I read every article you wrote for The Times,” he told Nelson Bryant, as the writer thumbed through the pages of a story that brought back memories of fishing a Cape stream. “It was that story that got me involved in everything,” Mr. Hopper told Mr. Bryant, then 88. A number of small dams and private diversions used to create private ponds affect the natural water flow, according to a town-commissioned report. The primary flow diversion occurs just south of Scotchman’s Lane, where a canal diverts water southwest to Parsonage Pond. Several other small surface diversions to ponds and wetland areas along Mill Brook are also present downstream. Despite it all, brook trout still survive in scattered freshwater brooks and streams along the upper reaches of Mill Brook. And that is the problem, if it were easy there would be clear answers. But much in the natural world is a connect-the-dots picture. Herring and eels provide food for striped bass and other migratory species. Prudy has been monitoring water temperatures at eight points on the stream. I am told that the typical water temperature range for brookies is 35-72, but they prefer nothing higher than 68, get stressed above 70, and cannot survive extended periods of time at or above about 75 degrees. Between June 10 and August 20 the temperature in Mill Pond ranged between a low water temperature of 70 degrees and a high of 84 degrees. Throughout that almost three-month period, the water temperature of the stream at its headwaters in the Roth Woodlands varied between 60.5 and 69 degrees. The most complete set of temperatures was provided for 1:30 pm on a sunny, 88-degree July 15. The water temperature at the Roth Woodlands was 69 degrees. It shot up to 80 degrees at the Roth Woodlands pond, the first man-made impoundment. It dropped back to 66 degrees at Witch Brook, a tributary of Mill Brook that feeds Crocker Pond. The temperature was 60 degrees in No-name Brook, which feeds Priester’s Pond, 80 degrees on that day. At Scotchman’s Bridge lane the temperature dropped to 75 degrees and Mill Pond measured a temperature of 78. At a point 200 yards downstream of the Mill Pond spillway the temperature remained 78. In an update to one of the projects Mr. Hopper described this winter, on May 30 and 31, a team of biologists captured 342 brook trout along about a half mile of Red Brook, which flows through the towns of Wareham, Plymouth, and Bourne. The year before they captured 327. This year there were more bigger trout, the team reported. What is curious to me is why West Tisbury, which relishes a self-image of a town committed to protecting the environment, has shown so little enthusiasm for the notion of removing a dam and the fish fryolator it creates. While West Tisbury residents feed the ducks and geese, other less enlightened towns are taking steps to remove dams. In August, Energy and Environmental Affairs Secretary Rick Sullivan announced $499,008 in grants for ten cities and towns as part of the Massachusetts Environmental Trust for projects to protect and restore rivers, watersheds, and wildlife across the state. For example, the town of Andover received $50,000 to complete permitting and final engineering for removal of the Balmoral and Marland Place dams on the Shawsheen River. The Jones River Watershed Association in Kingston received $40,152 to conduct preliminary design for anadromous fish passage from the Jones River into Silver Lake. The North and South Rivers Watershed Association received $22,000 for preliminary design and engineering for removal of the Tack Factory Pond dam in Hanover. And a Concord group received $20,768 to assess and protect brook trout habitat in the four Sudbury River tributary streams known to have wild brook trout populations. It would be good to see more of a willingness to discuss the notion of removing the dam and providing more water flow. One day, Mill Brook might be on a future list.